A new apartment complex with 104 units is being proposed for 30 and 34 University Crescent. This project is a work in progress and the developers would like to hear your views on the design of the building. For more info, visit the project website http://30uc.ca/ The public hearing for this project will be held at City Hall – the date has not yet been determined. Watch for signs to be posted on the property. The Winnipeg Free Press published an article on this development on February 20th. Furgus, along with Joel Rodrigues of JR Holdings, are behind the proposed apartment complex. Should the city give the project the green light, it is set to be built at 30 University Cres. This past month, the pair hosted an open house at a community centre on the 600 block of Silverstone Avenue, so area residents could come out, get information and express potential concerns. Roughly 50 people, including Coun. Janice Lukes (South Winnipeg-St. Norbert), came to the open house, Furgus said. The complex, which will have 63 one-bedroom units and 41 two-bedroom units, will not only cater to university students, but also empty-nesters in the area looking to downsize. 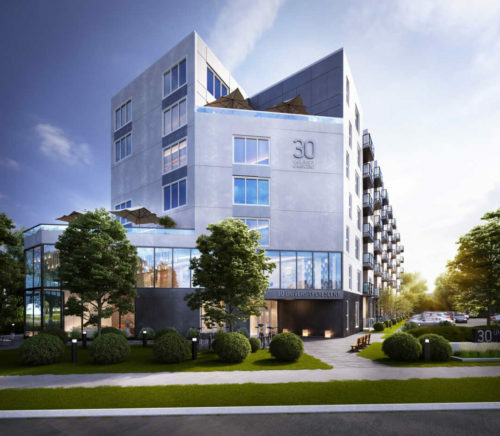 The units will range in size between 600 and 1,000 square feet, and the complex will feature underground parking and two rooftop terraces — the latter being a feature the developers feel makes the project unique in the city. The site of the proposed development is currently occupied by three single-family homes that aren’t in the best shape, Furgus said. The developers are asking the city to rezone those properties, so the project can take the next step forward. “We’ve submitted our reports to the city. We’re still waiting on permits and on the rezoning process. After the open-house public consultation, we submitted our zoning application, and building permit as well. Now, we’re waiting for the city to give us its feedback on our proposal,” Furgus said. “It can take three to six months. Nothing is ever a guarantee, but we feel confident we’ll be able to move forward and we’re hoping to start the development in the fall.” However, before that can take place, all variances, rezoning, subdivisions and building plans will have to be given the green light by the city. The proposed complex isn’t the only area development currently in the works. In October, the Riel Community Committee approved plans for a 32-unit complex on the 100 block of University Crescent. Back in February, a 197-unit complex on the 2000 block of Pembina Highway was also given the go-ahead.